The best way to discover the picturesque city of Lugano! Famed for its exclusive luxury boutiques, it offers countless natural attractions and spectacular landscapes. Indulge in a pleasant day’s relaxation amidst nature and entertainment. 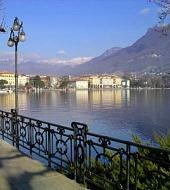 Hop aboard a sightseeing boat and cruise around chic Lake Lugano. 10:45 Arrival in Lugano and tour of the city. Boat cruise on the lake and free time for lunch. Afternoon trip on the small "Freccia Rossa" train.